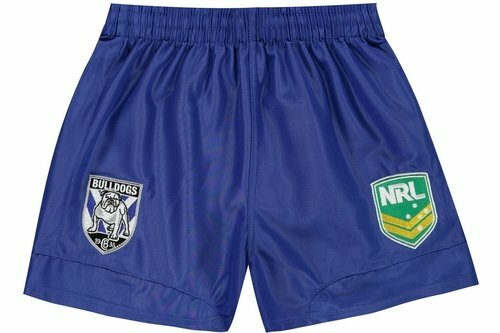 Show your support for the Doggies when you pull on these Canterbury Bulldogs NRL Kids Supporters Rugby Shorts from ISC. Canterbury Bulldogs play their rugby in Austalia's premier rugby league competition, the National Rugby League NRL as well as the New South Wales Rugby League junior competitions. They won their first premiership in their fourth year of competition with another soon after, and after spending the 1950s and most of the 1960s on the lower rungs went through a very strong period in the 1980s, winning four premierships in that decade. The Bulldogs have played predominantly in a blue and white strip since the club entered the league in 1935. Sticking with tradition these kids shorts are royal blue and feature the NRL badge on the left whilst the club badge is on the right.